Many of the species in the Common All-Year resident list are habitat generalists. They are seen over a wide range of landscapes. The species on this Less-common Residents list are fairly common, but tend to be more specialized in their habitats. 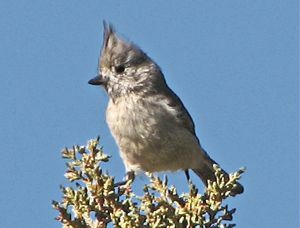 For example, the Juniper Titmouse and Canyon Wren are sometimes seen in the agricultural land, but they are almost always seen up arroyos or on the first mesa level in the Pinyon-Juniper Woodland. 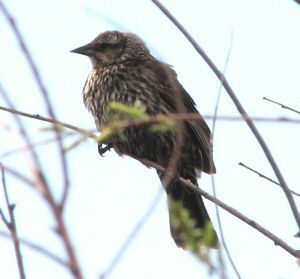 The Red-winged Blackbird ranges widely, but is most likely to be encountered in wet, marsh areas with Cattails growing. 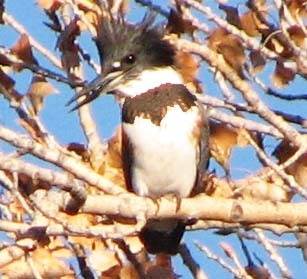 The Belted Kingfisher is rarely seen more than a few feet from the edge of the river. If you want to see these birds, you have to go to their habitats. Image Search Seen only on the Rio Grande. Note white mark on Cheek. 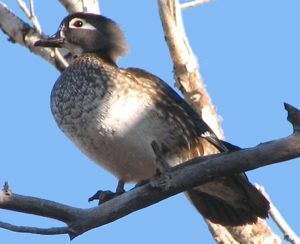 Image Search Male (top): Coloration and white neck markings distinctive. 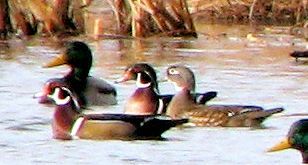 Female (middle): White Eye-patch distinctive. Image Search Adult is pictured. Note the horizontal barring on the breast and belly. 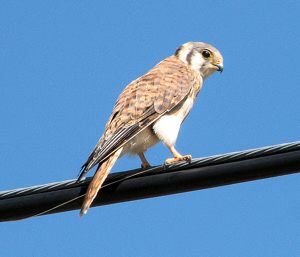 Image Search A falcon smaller than a Robin. Note dark vertical bars on cheek. 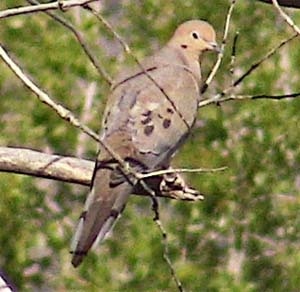 Image Search Generally seen flying in small groups (2-4 individuals). 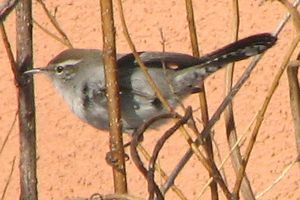 Note long, pointed tail which shows white edges when landing. 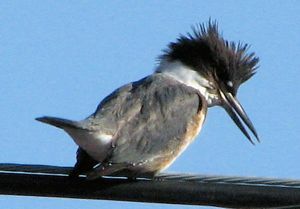 Image Search Perches on trees or wires near water. Hovers over water before diving for fish or crustaceans. Gives a distinctive long, loud rattle in flight. Male has gray breast band. 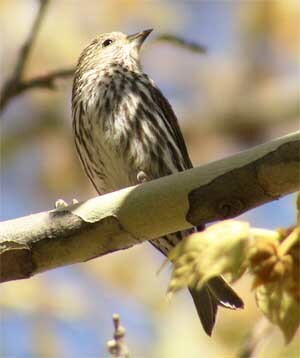 Female has additional rufous band below. 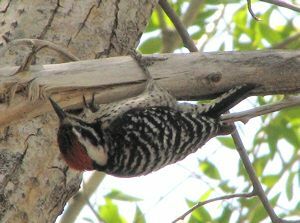 Image Search A distinctive red-bellied, black-backed woodpecker. 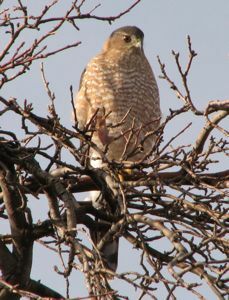 White ring on neck and throat usually visible when perched or in flight. Only woodpecker that "hawks" insects, making looping flights to catch insects before returning to the same perch. Image Search Small woodpecker with distinctive black and white barring on its wings and back. 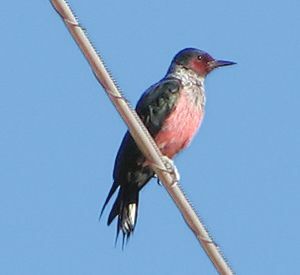 Male, with red crown, is pictured. 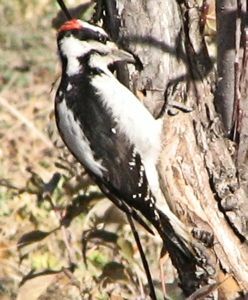 Image Search Very similar to Downy Woodpecker, but larger. Commonly distinguished by its large bill which is often as long as the bird's head from front to back. 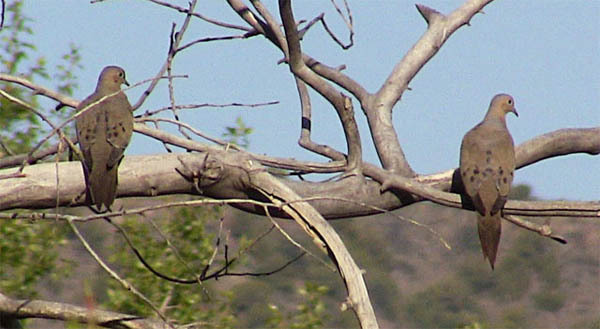 Image Search Generally seen in Juniper trees, the crest on the head is distinctive. Some of its vocalizations similar to Chickadee. 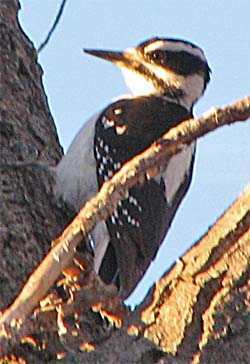 Often detected by soft woodpecker-like tapping on branches. Image Search More often heard than seen. It's song is a very distinctive series of descending notes: tew, tew, tew, tew, tew, tew, tew. Usually sings from rock perches high on canyon walls. 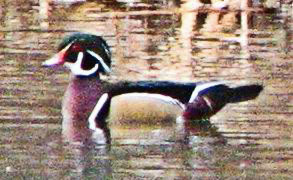 Occasionally seen in riparian areas sounding its very bright, shrill, trilled "breet". 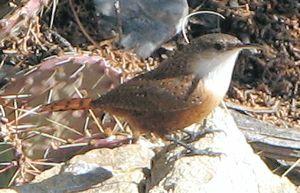 Note: White throat with rufous belly. Image Search It's very prominent, white eyebrow is distinctive. 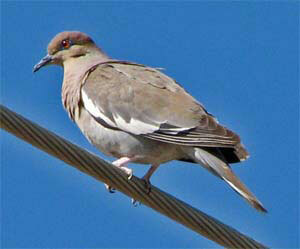 Most often seen at transition from Piñon-Juniper to agricultural or riparian areas. 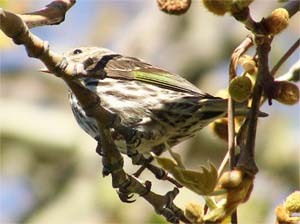 Song similar to Song Sparrow, but is "buzzier" and consistently ends on a clear trill. Image Search Female (Upper Picture) has brown streaking all over. 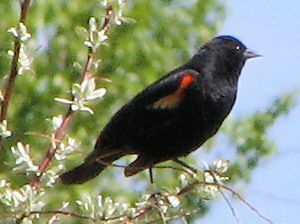 Male (Lower Picture) is black with red patches on shoulders. Outside of breeding times, the red may be hidden. 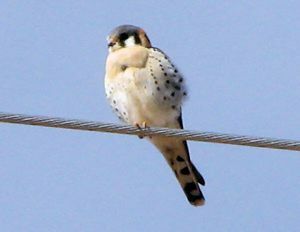 Both sexes have medium length, very pointed bill. 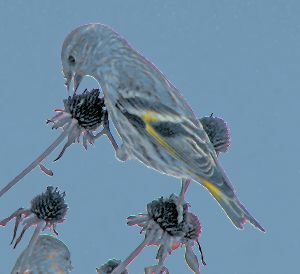 Image Search Often mistaken for a female House Finch, this lover of Thistle and other small seeds, has a distinctively smaller, sharply pointed bill. 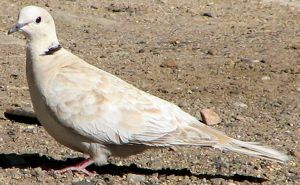 There is a subtle presence of yellow in the wings and at the base of the tail. The last, over saturated, photograph shows these markings. Often gives a raspy, rising, slurred "shee".